The Italian senate has adopted a package of austerity measures designed to avoid a bailout of the eurozone's third largest economy. The package is expected to get final approval in a vote by the lower house at the weekend, paving the way for PM Silvio Berlusconi to resign. A technocrat government possibly led by former EU commissioner Mario Monti is being debated. 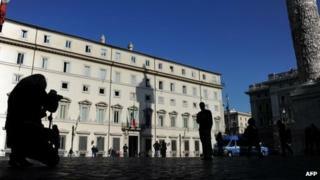 On Thursday, Italy raised 5bn euros (£4.3bn) from new government bonds. But this was at an interest rate of 6.087% to borrow the money for one year. All that Mario Monti has said publicly is that there is a great deal to do and there has to be an end to privilege - a reference, really, to the way the political class here is seen as getting too big a share of the national cake. The idea that politicians will have a lot of their benefits squeezed will play very well publicly, but Italy's problems go deeper than that. Everyone agrees the economy needs to be reformed, but the big question is how. If there is to be austerity, who should feel the pain most? In the street, they would tell you it needs to be the rich: the financiers, the bankers, the tax-evaders. On the other side of the debate, there are people who would say the public sector workers have had it too easy for too long - that employers must be allowed to hire and fire people more easily if business is to be given a freer hand. The senate voted by 156 to 12 in favour of the austerity package. The bill now goes to the lower house, the chamber of deputies, which will meet in special session at the weekend. Mr Berlusconi, who lost his parliamentary majority in a vote on Tuesday, has promised to resign after the austerity measures are passed by both houses of parliament. On Thursday, President Giorgio Napolitano - whose role is largely ceremonial - said he wished to "dispel any doubt or misunderstanding" on when the prime minister would fulfil his promise to resign. Italy's leaders are desperate to signal that they can bring the country's finances under control, says the BBC's Alan Johnston in Rome, and they are moving fast. Mr Monti, a well respected economist, is exactly the sort of man that the money markets would like to see take charge at this time of crisis, our correspondent says. The Italian president has made Mr Monti a senator for life. He was welcomed into the chamber at the start of Friday's session but then left for a meeting with President Napolitano. If the lower house completes its vote on Saturday, Mr Napolitano could accept Mr Berlusconi's resignation as early as Saturday evening. He could then formally ask Mr Monti or another candidate to form a government of technocrats. An EU team has begun work in Rome, monitoring how Italy plans to cut its crushing debt burden, 120% of annual economic output (GDP). The Italian economy has grown at an average of 0.75% a year over the past 15 years.